About | Vital Life Platform - Vital Life Platform | Better Than Ever! Our Intention is that, for those that have the eyes to see and ears to hear and heart to feel, that you feel inspired, educated and empowered by this information to move forward into realizing the Highest Vision and Potential for yourself in each moment and with each breath. 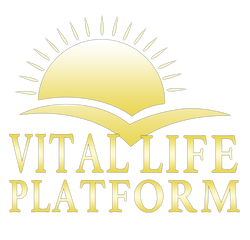 The Vital Life Platform is really a lifestyle; it's a way of being. The word "vital" signifies anything that is a manifestation of life. Therefore, anything that is "Vital" is life-generating. There are particular tools and ways of being that are essential to living a radiant, vibrant lifestyle - we are committed to providing these vital tools and the knowledge that enhances your understanding and commitment to a vital living way of life. Our Mission is to inspire, uplift and encourage as many people as we can to KNOW WHO THEY REALLY ARE. To provide the platform of consciousness, the principles and essential tools to experience a vital life! Every breath precious breath. We have the capacity to realize the highest vision we can possibly fathom for ourselves and all-the-world, for our families, for our friends and the world community; we allow ourselves to live freely, abundantly and harmoniously through devoting attention each day to connect with The Source of Life - our Infinite Self - and through enjoying raw, living, cultured, enzyme-rich foods, and foods that increase our vitality and life-force, being with Nature and the elements, and through practicing gratitude and love for ourself and one another. It is our vision to live in harmony and peace with all beings and continually enjoy the natural (joyful) evolution of this miracle called Life. We have an ever expanding vision of a new world-community coming together in the spirit of harmony, for the attainment of a definite purpose. Imagine sharing our expertise, talents, resources and abilities, lovingly and openly. Imagine the Abundance. We see stellar and pivotal movie theaters with conscious co-creative films, and vital, enzymes and energy-rich snack foods; we appreciate that everyone does what they love for a living and are truly fulfilled and abundant in health, wealth, relationships and mental/emotional/spiritual stability. We see massive beautiful healing centers bringing people who are not well and teaching them how to heal themselves through natural safe methods based on the Universal Principle of LOVE. ​The world is unfolding according the Divine Blueprint as decreed by the Head Creator. What is your highest vision for yourself and all the world? To provide awareness of Four Universal Principles of Life, vital tools, techniques, classes and products to carry you through the process of life with royal radiance, joy, abundance and harmony. The primary goal of living a vital lifestyle is to maintain cellular integrity and continually allow the increase of life energy within your mind, body and infinite, unlimited soul. Our Service to you is to share FOUR BASIC PRINCIPLES OF LIFE, essential tools and revolutionary information, supportive to creating an abundant, radiant, lean, clean and serene lifestyle. We are simply here to remind you of your True Nature and Who You Really Are...You are a spiritual, electro-chemical, unlimited, being, with unlimited potential! And life can only get better - for it is the natural progression of all things - betterment.